With special guest opener Jess Baldwin. Peoples Bank Theatre presents The Bob Thompson Band live in concert, with special guest Jess Baldwin. Since 1991 Bob Thompson has been the pianist, and a regularly featured artist on West Virginia’s NPR syndicated radio show, Mountain Stage. For the past twenty-three years he has also been co-producer and host of Joy to the World, a holiday jazz show, broadcast on public radio stations nationwide, and heard internationally on the Voice of America. In October 2015, Bob Thompson was inducted into the West Virginia Music Hall of Fame. Bob makes his home in Charleston, West Virginia, and has enjoyed a long and active career as a performer, composer, arranger, and educator. For decades he has played at festivals and concerts around the country, and has also taken his music to Europe, Africa, and South America. Bob Thompson’s resume includes guest appearances on Marian Mcpartland’s Piano Jazz, on National Public Radio, and Bet on Jazz with Ramsey Lewis. His recordings on Intima records, and Ichiban international, received high recognition on the jazz charts, with several reaching the top ten. His recent recordings, Bob Thompson “Live” on Mountain Stage, and Smile, with the Bob Thompson Unit, are on his own label, colortones.com. Bob’s current group, the Bob Thompson Band, has a new recording, “Look beyond the Rain,” released January 8, 2016 on Blue Canoe Records. In addition to Bob the band features saxophonist Doug Payne, guitarist Ryan Kennedy, John Inghram on bass, and Tim Courts on drums. After hearing Thompson live or on any of his numerous recordings — you might be surprised to learn how hard Thompson tried to avoid the keyboard as a kid. Although there was always a piano in his home in Jamaica, New York, Bob had little interest in learning how to play it. “When I was in junior high school, I had a piano teacher who came to my house to give me lessons. He thought I had some talent. So one summer, he told my mom he’d teach me for free, Thompson recalls. “I said I wasn’t interested. I didn’t want to spend the summer taking piano lessons.” Instead, Thompson picked up the trumpet, playing in various school bands. And when he arrived on the campus of West Virginia State College, he wanted to join the student jazz band. Only one problem: they already had a fine trumpet player. “He was great, and the trumpet spot was closed. So I started playing piano, just so I could be in the band and learn about the music from him,” Thompson says. It was a switch that stuck. And Thompson left the trumpet behind to hone his keyboard skills. While a student at West Virginia State College, Thompson formed the modern jazz interpreters, a piano trio who appeared at the Notre Dame Jazz Festival in 1964. Shortly thereafter, Thompson received a valuable lesson from another performer, Chicago saxophonist Bunky Green, who joined the band on a State Department tour to Algiers. That’s advice which Thompson has followed throughout his professional career, which began with the jazz interpreters, and then later on his own in the 1970s. Through the 80s, Thompson released a series of widely acclaimed solo albums, recording first for his own Rainbow Records and then on Capitol’s Intima jazz label. “Violinist John Blake encouraged me to record my own compositions. He was a big inspiration.” Blake produced the recordings “7 in 7 out” and “brother’s keeper” with guests like bassist Gerald Veasley, guitarist Kevin Eubanks, and drummer Omar Hakim. Hakim also produced Thompson’s 1986 album “say what you want.” The albums are tasteful, thoughtful, contemporary jazz. These recordings garnered strong airplay on radio stations nationwide. Meanwhile, Thompson moved to Atlanta-based Ichiban international records to release the albums Love Dance (1992), The Magic in Your Heart (1993), Ev’ry Time I Feel the Spirit (1996) and Lady First. Ev’ry Time I Feel the Spirit, which is a collection of spirituals performed in Thompson’s unique contemporary jazz style, was re-released in 2003 on DM Records. In between concerts and festival gigs, Thompson can still be found playing clubs in Charleston — something he says keeps him close to his musical roots. 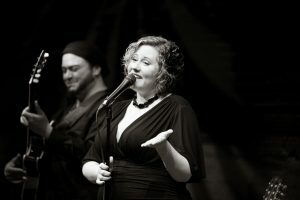 Jess Baldwin’s voice has been described as “world class,” “effortless,” and “pure beauty.” She performed on Mountain Stage in 2013 with John A. Walsh’s The Fields of Gettysburg, won Best Cover Song in the 2015 Ohio Music Awards, and was a quarterfinalist in the 2015 American Traditions Competition. She brings souvenirs from diverse vocal worlds into her jazz quintet. Among cover songs by modern artists like Alan Hampton, the Portico Quartet, and Esperanza Spalding, she peppers her own playful, yet contemplative jazz arrangements of pop-rock artists like Björk and Weezer, country artists like Gillian Welch, and classical composers like Barber and Bach. She is joined by an all-star cast of regional musicians: guitarist Ryan Kennedy, pianist Sean Parsons, bassist Andy McVey, and drummer Andy Hall.